J. T. Black received his Ph.D. from Mechanical and Industrial Engineering, University of Illinois, Urbana in 1969, an M.S. in Industrial Engineering from West Virginia University in 1963 and his B.S. in Industrial Engineering, Lehigh University in 1960. J T. is Professor Emeritus from Industrial and Systems Engineering at Auburn University. He was the Chairman and a Professor of Industrial and Systems Engineering at The University of Alabama-Huntsville. He also taught at The Ohio State University, the University of Rhode Island, the University of Vermont, and the University of Illinois. He taught his first processes class in 1960 at West Virginia University. J T. is a Fellow in the American Society of Mechanical Engineers, the Institute of Industrial Engineering and the Society of Manufacturing Engineers. Ron Kohser received his Ph.D. from Lehigh University Institute for Metal Forming in 1975. Ron is currently in his 37th year on the faculty of Missouri University of Science & Technology (formerly the University of Missouri-Rolla), where he is a Professor of Metallurgical Engineering and Dean's Teaching Scholar.While maintaining a full commitment to classroom instruction, he has served as department chair and Associate Dean for Undergraduate Instruction. He currently teaches courses in Metallurgy for Engineers, Introduction to Manufacturing Processes, and Material Selection, Fabrication and Failure Analysis. 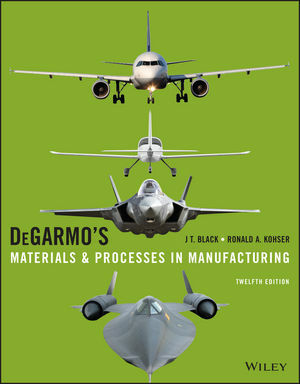 Four additonal chapters are provided online at the book website: these chapters cover electronic manufacturing, thread and gear manufacture, nondestructive testing and inspection, and the enterprise (production system).